Click here to purchase Snowbeast on Blu-ray from Amazon! 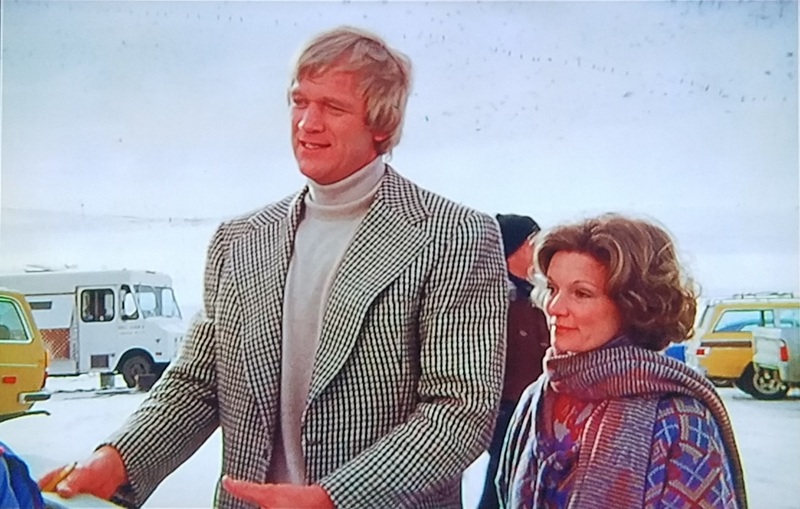 Snowbeast is a 1977 made-for-television horror film, originally airing as CBS’s Late Night Movie on April 28, 1977, focusing on a sasquatch creature’s assaults on the guests and employees of a secluded ski resort located in the mountains of Colorado. The film was directed by Herb Wallerstein, who had plenty of directing experience on television series such as Star Trek and The Brady Bunch, but had never actually directed a movie until Snowbeast. The teleplay for the film was written by Joseph Stefano, who is undoubtedly best known for writing the screenplay for Alfred Hitchcock’s Psycho. Stefano also wrote the screenplay for the 1972 made-for-TV film Home For The Holidays, starring Sally Field. The film was recently released to Blu-ray by Fred Olen Ray’s Retromedia label. The release features both the 72-minute television cut of the film (complete with the original CBS Late Night Movie intro) and the 88-minute international theatrical cut. Whichever version you choose, Snowbeast wastes little-to-no time getting the action rolling, with the titular creature attacking its first victim within only a matter of minutes. A young woman is mauled by the beast as she hits the snow trails with her friend. The friend (Annie McEnroe – Beetlejuice, The Hand) escapes, but the young woman disappears. The attack occurs just as Rill Lodge, the local ski resort, is preparing for its 50th Annual Winter Carnival. Calling the event a “carnival” is more than a little misleading, if you ask me. I mean, all of the scheduled events involve snow skiing and there aren’t any Ferris Wheels or cotton candy machines anywhere to be seen. The lodge is owned by Ms. Carrie Rill (another Beetlejuice co-star, Sylvia Syndey), and managed by her grandson, Tony (Robert Logan – TV’s “77 Sunset Strip“, Adventures of the Wilderness Family). Tony is informed of the incident involving the young woman, although the part about a sasquatch being involved has been excluded (as most are blissfully unaware of the creature’s existence at this point.) 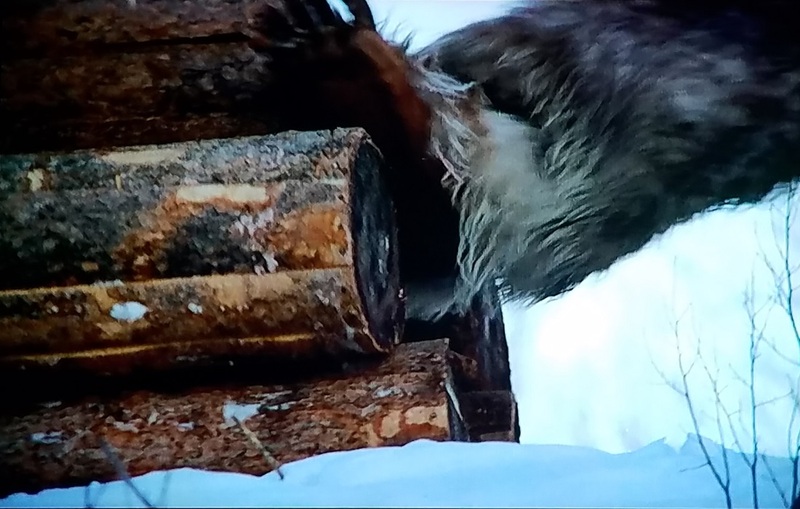 The surviving girl informs Tony that she did hear the creature’s growl and discovered its tracks, but no sign of the beast or the girl have yet been discovered. Tony searches the ski trails for the missing girl, but only finds her bloodied, tattered clothes. He also hears the creature’s growls before catching a glimpse of the creature at the edge of a nearby wooded area. He returns to the resort and tries to warn his grandmother, but as this is the resort’s big event of the year, she’s not quite prepared to “believe” his claims, as it would interfere with business. 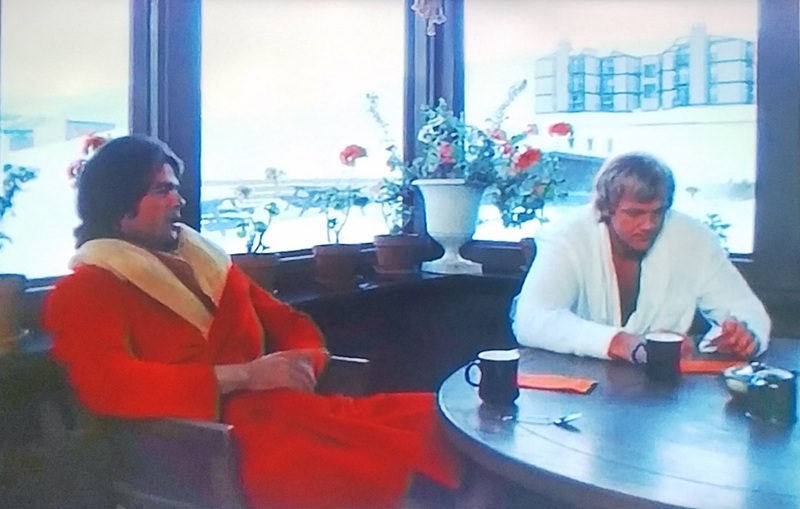 At around the same time, Gar Seberg (Bo Svenson –The Inglorious Bastards (78), Walking Tall II & III), an aging former Olympic skier and former friend of Tony’s, returns home to the mountains seeking work. Tony may still harbor a few resentments against Gar, namely that he’s now married to Tony’s former flame, a reporter named Ellen (Yvette Mimieux – The Time Machine, Devil Dog: The Hound of Hell). However, Tony offers his old friend a job nonetheless. Little does Gar know at the time, but that “job” is hunting down and killing the creature!! Gar is initially offended by the proposition, believing that the creature (if it actually does exist) is supposed to be harmless, and that it is only being targeted for being different and/or “unknown”. However, he soon changes his mind upon the discovery of the missing girl’s brutally mauled corpse. Ellen’s disappearance while snooping on the crime scene only serves as further motivation. Any doubt that anyone had to the creature’s existence is quickly put to rest when the Snowbeast attacks a rehearsal for the winter carnival later that same night! 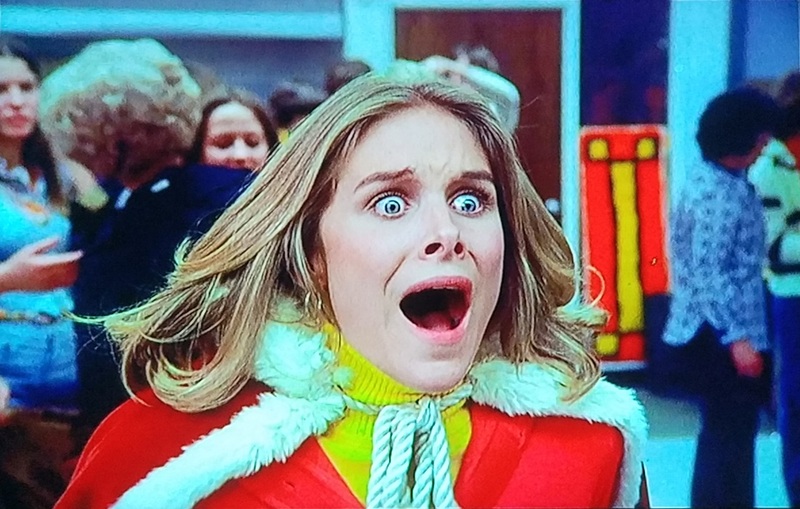 This scene is easily the highlight of the film, what with the creature’s presence causing panicked citizens to trample each other in their escape, as well as the mauling death of carnival queen’s mother. 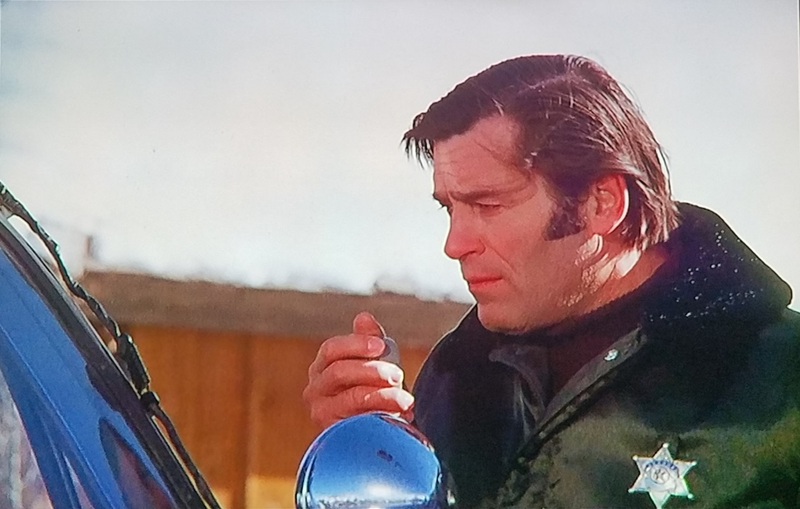 In a scene that feels somewhat lifted from Jaws, the local sheriff (Clint Walker of The Dirty Dozen & TV’s “Cheyenne“) kills a grizzly bear, dragging it into town and labeling it the cause of all the recent troubles. Unfortunately, this scene takes place AFTER the beast’s attack on the carnival rehearsal, in which multiple townsfolk saw the large biped creature that was causing all the commotion. This asks the viewer to suspend disbelief a little more than they may be willing to do. And this is a sasquatch movie that we’re talking about, for Christ’s sake. Suspending disbelief is kind of a pre-requisite for these films. Tony, Gar, and the Sheriff decide to team up and track down the real beast once and for all. Ellen tags along for good measure. This leads to one particularly interesting scene in which the Snowbeast destroys an RV by rolling a stack of logs into the vehicle’s side. There are some highly questionable physics at play here as the logs, despite crashing into the RV’s side, manage to find their way in the vehicle’s back door. This leaves one character trapped and vulnerable to a fatal squatch attack. As expected, the film ends with a final showdown with the creature. However, the “build-up” to this fateful encounter takes a tad too long, especially considering how subdued and… well, anti-climactic the ending actually is. There is no epilogue. No final goodbyes. Just some end credits and a fade to black. The TV edit of the film cuts out most of the scenes of Tony informing Gar about the creature and his reaction to the task asked of him, as well as most of the scenes at the first body’s discovery. This not only edits out all of Clint Walker’s early scenes, but also removes all explanation as to why Ellen went missing. The print features a few random green specks, but is generally clean and surprisingly sharp at times. While probably not the best that the film can look, the transfer is still a major upgrade from all those versions found on numerous budget-priced Standard Definition DVD collections. That said, the blu-ray release features its own share of blemishes. Most notably, the blu-ray transfer frequently suffers from issues with color saturation and tinting. At times, the color levels seem to be jacked up a touch too much. There are also some issues with tinting late in the film, albeit at a much lesser extent than the saturation issues. That said, snow, at times, looks a touch pink in later moments of the film. It’s also worth mentioning that while there’s no justifiable reason to have chosen the shorter version of the film, the television edit of the film may feature a marginally stronger transfer. The scenes retained in the international cut of the film do feature a notable drop off in clarity and sharpness. More alarming is that the color saturation issues frequently tend to make these “additional” scenes look blurry. Sound levels are also inconsistent. At times, dialogue and effects are clear, if a touch “tinny” sounding. At other times, I was forced to raise my speaker volume higher than I normally would just to clearly hear dialogue. And even then, audio was not what I would call “loud”. The film is presented in a near 4:3 aspect ratio, with black bars on the side of the image. As you can tell, I have edited the bars out for the review screenshots. The only “Special Feature” included on the release is a commentary track from Fred Olen Ray and David Decoteau (Creepozoids, Sorority Babes in the Slimeball Bowl-O-Rama). Ultimately, the Retromedia blu-ray release of Snowbeast is only going to be of significant interest to those few devout fans of the film. While flawed, it still presents a much better picture quality than any of the budget priced DVD releases available out there, which fans of the film presumably already own. The extended cut of the film is a treat for those that have not seen it, and is truly the ideal way to experience the film, but as this cut of the film is available on many of those same budget bin releases that I previously mentioned (as well as on Youtube), it’s not something that I’d call “rare” or “exclusive”. And I’m sure that more than a few “film historian’ types will get a kick out of the commentary from Ray and Decoteau. At $15, the release isn’t quite “budget” priced, but it’s also not as overpriced as some of those “collector editions” from other labels. So, a few casual fans of the film may want to make the splurge purchase as well. Enter with tempered expectations and you might be as pleased with this release as I was. It’s not the best this film can look, but it’s surely the best option for now.